The teen years can be a period of challenge, a little like the terrible twos, except now your kid is several inches taller than you. Mom and dad may find that a formerly compliant child has become a stranger. Nutrition-related issues either become an arena for conflict or shared learning for everyone. Some teens become vegetarian or vegan, independent of their family’s way of eating. Non-vegetarian parents can often be supportive if the youngster eats a nutritionally adequate diet. It helps even more if the teen gets into the kitchen and prepares foods to complement the baked potatoes, salads, steamed broccoli, grain products and fruit the rest of the family eats. Typical food items required are the protein-rich beans, peas, lentils and veggie “meats.” Stock up on canned vegetarian chili, baked beans, black bean soup, lentil or pea soup and put Gardein’s tasty products in the refrigerator or freezer. It can be both economical and rewarding for a youngster and parent to get together once a week, put on some music and prepare a pot of bean soup to store in the freezer in individual portions. This can provide a teen with food preparation skills that will empower them when they are out in the world. The reverse situation is also common. A teen in a vegetarian family may explore being a part-time meat eater and parents may need to support the youngster’s choice when he or she is out with friends. For those wondering how to fill veggie-style lunch bags, these should include protein-rich foods and whole grains for continued energy through the afternoon. It may seem that if we’ve given up meat and cheese, there’s not much else to fill a sandwich with. Fortunately, there are plenty of easy fillings, including slices of flavoured tofu from the supermarket, hummus (either home-made or commercially-prepared in a variety of flavours), nut and seed butters and veggie “meats” such as Yves Meatless ham, pepperoni, salami or turkey. These can be put in a fresh roll or baguette or between slices of whole grain bread (try rye or sourdough), stuffed in a pita pocket, and rolled in a tortilla. For spreads, use a tasty mustard, guacamole, olive tapenade or eggless mayo. Add sliced avocado, cucumber, green, red, or yellow pepper, onion (red or green), sprouts (alfalfa or sunflower), tomato or shredded carrots. Gluten-free wraps include rice cakes, corn cakes and rice paper wraps. Another welcome choice is the nori roll. Two main questions teens ask about dinner are: “Does it taste good?” and “Is it ready?” In families with a variety of dietary choices represented, favourite plant-based meals are often international in flavour, including falafels, tacos with refried beans, veggie burgers with all the fixings and pasta with marinara sauce. 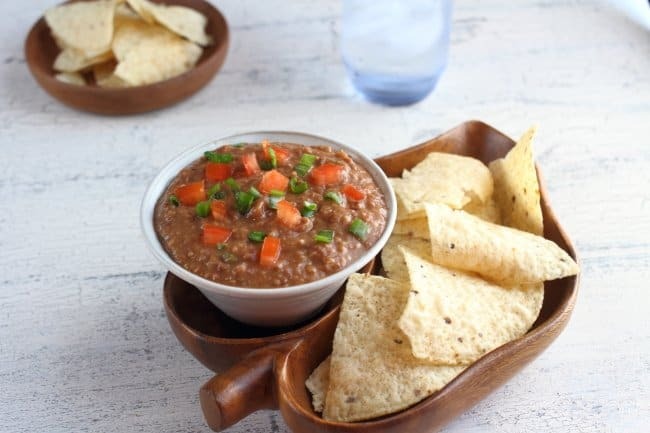 Combine the beans, tahini, lime juice, water, chipotle, garlic, cumin, oregano and salt in the bowl of a food processor and puree until smooth. Add cilantro, olive oil and blend for 5 seconds. Season to taste.